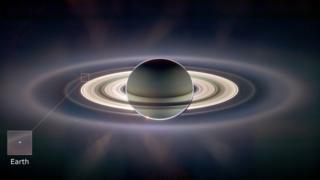 As the Cassini spacecraft's mission comes to an end, we look back on 13 years of stunning images from the Saturn system. This majestic panorama was taken while Saturn was blocking the Sun, from the viewpoint of the Cassini spacecraft. On 15 September 2006, the orbiter drifted through Saturn's shadow for 12 hours, allowing scientists to piece together this mosaic image from 165 individual pictures. 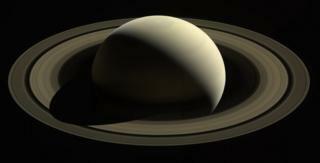 In the bottom left hand side of Saturn, you can see the refracted image of the Sun peeking through the planet's limb. The faint outermost ring is composed of icy material from Saturn's moon Enceladus and is known as the E ring. Far in the distance, visible on the left above the main bright rings, is the pale blue dot of Earth. 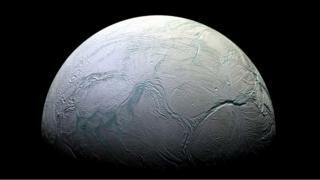 This enhanced-colour mosaic shows Saturn's icy moon Enceladus captured by Cassini's cameras on 9 October 2008. Water-ice gushes into space through openings at the south pole known as tiger stripes. The deep chasm on the right of the picture is known as Labtayt Sulci. 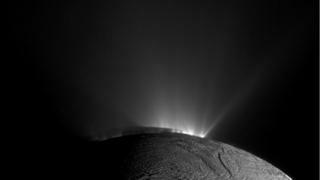 The geysers are one sign of the global ocean of water beneath Enceladus's icy outer shell. Cassini has flown through the jets and tasted them using its science instruments. They contain organic compounds as well as rocky material. This points to hydrothermal activity occurring on the ocean floor. The moon ticks all the boxes as a potential habitat for life beyond Earth. 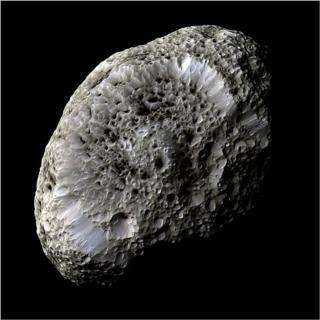 This view of Saturn's moon Hyperion brings into focus its bizarre, sponge-like surface. Cassini took this picture of the 270km-wide satellite as it swept past in 2005. The moon's low density suggests it may be composed largely of water-ice with only a small amount of rock. It could be a remnant of a larger moon that was destroyed in a giant cosmic collision. 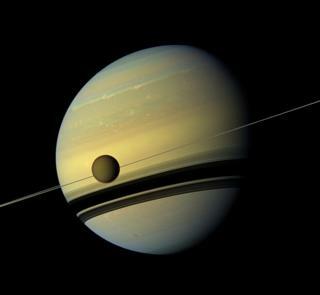 Saturn's largest moon Titan appears before Saturn and its rings in this natural colour view. 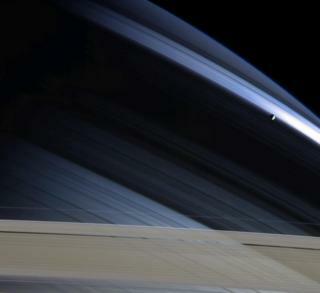 The picture is a mosaic, combining six images from Cassini's wide-angle camera on May 6, 2012. It captures Saturn in a seasonal transition. The azure blue colour in Saturn's northern hemisphere that greeted Cassini when it arrived in 2004 was fading to yellow, while the southern hemisphere was changing from yellow to blue. The colour shifts are due to the effects of ultra-violet light on the atmosphere. As the changes occurred, spring was coming to the northern hemisphere and autumn was coming to the south. This near-infrared, colour mosaic shows the sun glinting off Titan's north polar seas. There are three large seas, or maria, at the pole, which are filled not with water but liquid methane. The average surface temperature of -179C on Saturn's biggest moon means that many of the roles filled by water on Earth are filled on Titan by liquid hydrocarbons. 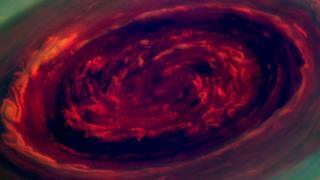 Bearing a slight resemblance to a giant rose, the spinning vortex at Saturn's north pole is bigger than any on Earth. The storm's eye measures more than 1,500km in diameter, making it 20 times larger in size than the typical eye of a terrestrial storm. And the winds around its centre travel at 530km/h, or twice the speed of a Category 4 hurricane. On 30 November 2010, Cassini's narrow-angle camera acquired this image of water-ice geysers erupting at the south pole of Enceladus. The moon's shadow can be seen on the lower portions of the curtain of water jets. 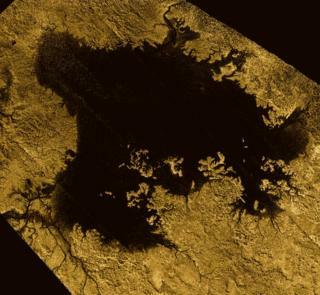 Ligeia Mare is the second largest body of liquid on Saturn's moon Titan. 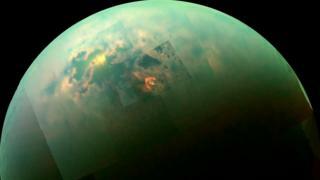 It is filled with liquid hydrocarbons, such as ethane and methane, and is located in Titan's north polar region. This image is a false-colour mosaic of synthetic aperture radar images obtained by Cassini between February 2006 and April 2007. 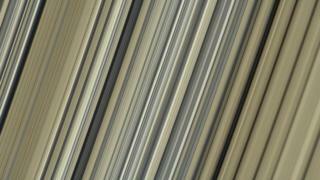 This high resolution, natural colour view of the rings was taken on 6 July 2017, after Cassini had begun the final set of orbits that would culminate in its destruction. The picture shows a part of the inner-central portion of Saturn's B ring. 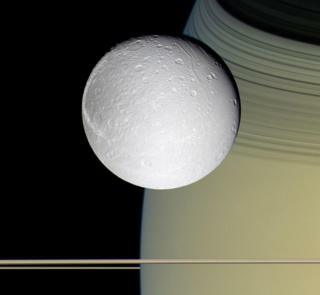 Saturn's icy moon Dione hangs against the gold and blue of Saturn and its rings. The shadows cast over the planet's northern hemisphere come from the C ring and part of the B ring. This was one of Cassini's last shots of Saturn and its rings from a distance - and it's breathtaking. This composite view comes from images taken on 28 October 2016, at a distance of 1.4 million km (870,000 miles) from the planet. 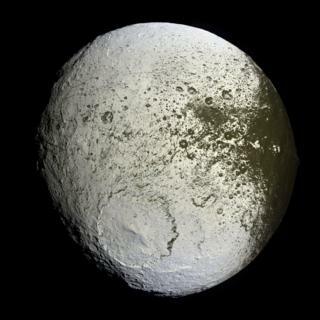 Iapetus is a bizarre, yin and yang moon of Saturn, with one "face" that's as dark as coal and another that's snowy white. The two very different halves explain a mystery from the 17th Century, when astronomers noticed that it was only visible through telescopes during half of its orbit. Scientists think the icy moon may be sweeping up dark, carbon-based material from another Saturn satellite called Phoebe, which has a sombre hue. In this image from 24 September 2015, the moons Enceladus (nearest to Cassini) and Tethys line up almost perfectly. 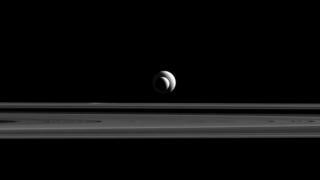 The satellites are at similar distances from Cassini, so how the moons appear in this image is a good approximation of their relative sizes. The battered, lonely moon Mimas can be seen on the right of the picture against the backdrop of the azure northern hemisphere of Saturn. Shadows cast by the rings arc across the planet in this composite image taken on 7 November 2004 by the narrow angle camera. For more great images from Cassini and the Huygens probe, see "Our Saturn years", the story of the mission as told by the people who worked on it.